﻿ India ranks 76th on WEF’s global Energy Transition index; Sweden on top. India ranks 76th on WEF’s global Energy Transition index; Sweden on top. WEF said India is amongst the countries with high pollution levels and has a relatively high CO2 intensity in its energy system. 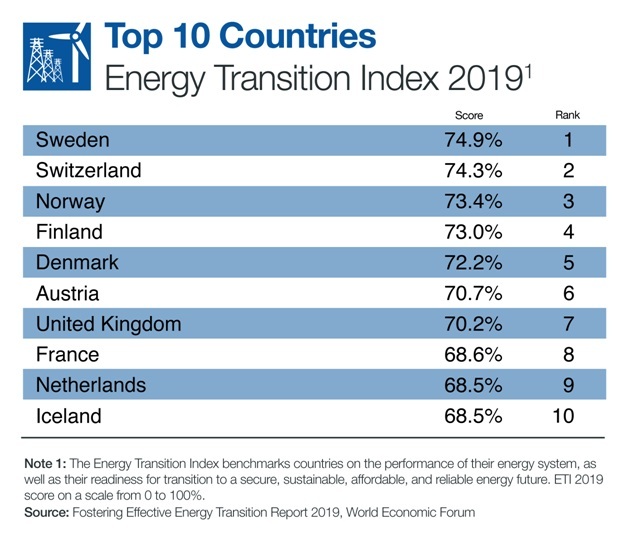 The WEF said its index considers both the current state of the countries’ energy system and their structural readiness to adapt to future energy needs. The biggest challenge facing attempts to future proof global energy is the lack of readiness among the world’s largest emitters. The 10 countries that score the highest in terms of readiness account for a mere 2.6 per cent of global annual emissions, the study found. “The world’s transition to secure, affordable and sustainable energy has stagnated, with little or no progress achieved in the past five years,” it said. It said continued use of coal for power generation in Asia, increasing commodity prices and slower-than-needed improvements in energy intensity have contributed to this year’s stagnation in performance. The ‘transition readiness’ component of the index has taken into account six individual indicators: capital and investment, regulation and political commitment, institutions and governance, institutions and innovative business environment, human capital and consumer participation, and energy system structure. The WEF said fossil fuels’ share of total primary energy supply at 81 per cent has been constant over the past three decades.